A former family court judge in Syracuse should be barred from returning to the bench, the State Commission on Judicial Conduct ruled Wednesday, after an investigation into an act of sexual misconduct 40 years ago with his niece, 13 years before he became a jurist. 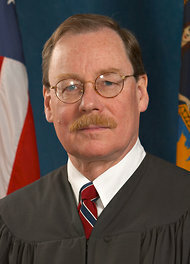 The judge, Bryan R. Hedges, was 25 and a student at Syracuse University’s law school when, during a visit in 1972 to his mother-in-law’s house in Albany, his niece, then age 5, entered a bedroom where he was masturbating, according to a report released by the commission. The girl, now 45, testified that Mr. Hedges gestured for her to place her hand on his. He denied encouraging his niece, but acknowledged she touched his hand for a few seconds, after which, he said, he quickly rolled over to end the encounter. This is really sick. While I am inclined to believe that family court judges are twisted perverts anyway, it is crazy to make such a big deal out of such a trivial incident 40 years ago. My guess is that Warner (the girl/woman) has been damaged much more by psychotherapy than by this incident. How much does she need to understand? Hmm. For one thing, Hedges might have been a typical crooked family court judge who took away parents' custody rights for frivolous reasons. For another, I wonder why the state judicial commission couldn't have taken him down on real misconduct on the bench. In fact the California judicial commission actually rejected your complaint about Irwin Joseph based on his extrajudicial activities influencing his rulings. Speaking of complaints, I wonder if you've heard from the CA Board of Psych regarding your complaint against Ken Perlmutter, which i think was very well grounded. The state board guidelines state: "If your complaint involves a more serious violation, such as an allegation of sexual abuse, gross negligence, or incompetence, it will be immediately referred for formal investigation by a trained peace officer employed by the Medical Board of California. You will be informed of this step and will later be interviewed by the investigator assigned to the case...If the investigation finds evidence to support your allegations, the Board will submit the case to the Attorney General for consideration of formal disciplinary action against the psychologist's license. You will be notified of this referral." Has the state done this yet, and if so are you banned from discussing the case publicly? If Perlmutter is actively fighting your complaint, then your case may end up before an admin law judge, and the board of psych says (same link): "The administrative disciplinary process may take up to two years." The state board did nothing. I have no idea whether they even read my paperwork. I do not think that they are serious about investigating violators, because they should have taken Ken Perlmutter's license away. And Morse accused you of lacking empathy, huh ? I have known women who have endured things 100 times worse, with no lasting damage. I can empathize with the women that you don't know, as well as the women who have known you. Okay, Anonymous, you win the empathy contest. There's no contest. I'm just willing to consider the women that you haven't known. Would you consider such an incident trivial if it involved your daughter ? I would not like it if an uncle did that to my daughter. If my daughter were still complaining about it 40 years later, I would tell her to move on. This family court judge probably did worse things in his courtroom everyday. It is crazy to fire him for this. I just don't see it as a "trivial incident". In George's defense, I would speculate that the judge's niece more likely felt bothered 40 years later because someone else, like a shrink, convinced her to be bothered, rather than out of her own judgement (no pun intended). And the blog author has criticized psychotherapy and psychology before. This is an example of how psychotherapy does more harm than good. It is crazy to persuade a woman to focus on some minor event 40 years ago. Sure, a psych. could exaggerate an experience with a patient that wasn't much of an issue, but describing sexual abuse with a 5 year old as "trivial" and "minor" demonstrates a lack of empathy in my view. Besides, the article doesn't even reference a psych. much less a psych. persuading the woman to focus on it, etc. , it says that the woman told her mother that she was still bothered by it, not a psych. Here's what George said about the Texas judge who was caught on video tape beating his teenage daughter for using her computer. George seems to think that holding a particular job is a crime, and beating and sexually abusing kids is not. "I am surprised that they would say that this is criminal. His real crime is that he is a family court judge." A 45yo woman is not bothered by such an incident from 40 years ago unless some shrink convinces her to be bothered by it. Where did you hear or read this ?